Leeds Stove Centre are pleased to announce that we are now stocking TermaTech Stoves. They are not as widely known as other stove manufactures, however at Leeds Stove Centre we recognise the quality in this upcoming brand and love the modern style of the stoves. With an excellent choice of Wood Burning Stoves to choose from in square and cylindrical shapes your certain to find your perfect stove at the Leeds Stove Centre. TermaTech stoves also come in a choice of black and silver colours. For many people, the Termatech range of stoves is one of the best kept secrets in the UK stove market because these are quality machines at very affordable prices. All of the TermaTech Stoves that we have available online are eligible for home delivery and installation in our covered area. TermaTech Stoves offer exceptional value for money whilst not compromising on quality in the slightest. TermaTech are also using advanced combustion technology that has created something of a precedent going forward in the UK. One of our favourite TermaTech Stoves is the TT20 Wood Burning Stove. This fantastic, modern styled stove looks great in a modern home, offering unique styling and a high heat output, it does not only look good, but is extremely practical. 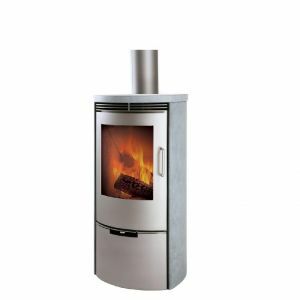 This Wood Burning Stove is capable of heating 30 to 140m2 therefore is ideal for large and small rooms. The stove comes with a wood store at the bottom of the stove which can be hidden with its door or shown on display if desired. When developing the TermaTech TT20 Wood Burning Stove, importance is given to simple, genuine quality in a modern and minimalistic design. The focus for this stove is on a long life, ease of use and environmentally friendly combustion. 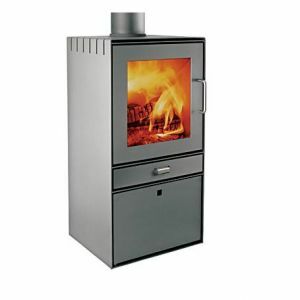 The stove can also be connected to rear or top flue systems and is available in Black or Grey. *Price correct at the time the article was written and is subject to change at anytime without warning.